In 1976, George Romero was in need of a comeback. After releasing the ill-fated suburban witchcraft film Jack’s Wife (a.k.a. Hungry Wives; Season of the Witch) and the intriguing, yet ultimately redundant toxic horror film The Crazies (a.k.a. Code Name: Trixie), both released in 1973, Romero spent the time in between making a series of sports documentaries called The Winners. Each hour-long episode, which was usually shown following Monday Night Football, highlighted such sports personalities as Kareem Abdul-Jabbar, Mario Andretti, Franco Harris, and O.J. Simpson. It was a far cry from his horror classic Night of the Living Dead. Romero really didn’t have any choice in the matter. He owed a lot of money to previous investors and was advised by his newfound producing-partner, Richard Rubinstein, to halt all further films until their company, Laurel Films, had recovered from debt. After three years, Romero and Rubinstein had started to work themselves out of the financial rubble, and Romero was hungry to do another feature. They wanted to make Dawn of the Dead. But with only $100,000 at their disposal, that simply wasn’t enough money to create their mythic zombie apocalypse. So Romero whipped up the script for Martin and soon after began filming what is arguably his finest achievement to date. A painfully shy and obviously disturbed young man, Martin (John Amplas), believes himself to be an eighty-four-year-old vampire from the Old World, albeit one who has some very New World methods for subduing his prey. You see, Martin doesn’t have any fangs, nor does he sport a cape or slumber in a coffin within a deep, dark sepulcher. Instead, Martin has a completely modern method of taking down his victims. He’s cool, clinical, and oddly enough, caring. His feeding utensils are a simple syringe filled with sodium pentothal to knock out his victims, razor blades to slice open their veins, some rope and duct tape, and a lot of cunning. Martin is very good at what he does. The opening sequence aboard a train, with Martin sneaking into a woman’s (Fran Middleton) sleeping compartment and subsequently murdering her, is chilling and nightmarish in its matter-of-factness. It also shows us Martin’s craftiness: he makes the woman’s death appear to be a suicide. Martin may be tortured inside, but that doesn’t mean he wants to get caught. During this sequence we are also given the first of many black-and white "flashbacks" –- replete with torch-carrying angry mob -– which are intended as either Martin’s fantasies or his genuine memories. Romero never takes a cinematic stand on the issue, leaving it ambiguous. The flashbacks offer us an insight into Martin’s inner-life. To himself, he is no longer the vulnerable, tortured misfit; he is handsome, courageous, lusted after by his victims, and the personification of the Byronic anti-hero. His fantasies are fueled with images from too many horror movies and popular culture cliches of the vampire. When Martin gets off the train, an old man wearing a splendid white suit meets him. The man is Martin’s elder cousin, Tata Cuda (Lincoln Maazel), and he has been given the task of looking after Martin. But Cuda is in no way sympathetic to Martin, for Cuda has his delusions also and makes it very clear that he will destroy Martin if one person is killed in their town. Cuda, with his rabid faith in God and his belief in the superstitions of the vampire, will now become Van Helsing to Martin’s Dracula. 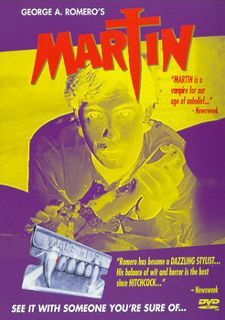 Throughout the film Romero pits Martin and Cuda against one another –- Cuda stringing garlic and bells outside of Martin’s door; bringing a priest to the house to perform an exorcism on Martin –- leaving the viewer sympathetic to a character who initially inspired horror. Romero posits the idea that Cuda and Martin are cut from the same cloth because they are both products of dogmatic religion and small-mindedness within the community. How the vampire myth became linked with Martin’s lineage is unclear, but Cuda later explains to his granddaughter Christina (Christine Forrest) that Martin was one of three vampires in their family and that he will also be the last. Christina refuses to believe Cuda’s superstitious tales and ultimately befriends Martin. As a single woman living in a dead-end town, with thoughts of liberation swirling in her head, she, too, feels persecuted and hopeless. Romero’s sense of humor toward the vampire myth (the nightly radio talk show where Martin becomes a semi-celebrity for all the lonely souls tuning-in) and his playfulness at sending up the myth resonates as strongly as anything in Dawn of the Dead, with its hoard of consumer-crazed zombies. And Romero’s skill for tightly wound set pieces (the murder of an adulterous couple in their home) is also on par with any of the action sequences in his living-dead trilogy. However, the scene in which Martin is being chased by two cops and then stumbles upon a drug deal, setting off a rather lackluster gun battle, doesn’t hold together and seems intended for another movie. Ultimately, what plagues Martin is not magic; it’s a sickness. But which one wins out is ultimately played out in the film’s tragic yet ironic finale. Anchor Bay’s DVD is a welcome treat, finally showcasing Martin as one of the great horror films of the 1970s and, despite its limited budget, one of the best photographed. Mike Gornick’s cinematography perfectly captures the blue-collar wasteland of Braddock, PA, as a desolate, mundane graveyard of the soul. The film is presented full-frame, and also contains a lively and anecdote-filled commentary with George Romero, special-effects artist and actor Tom Savini, and star John Amplas. Martin is now available on DVD from Anchor Bay Entertainment in a full screen presentation. The DVD features an audio commentary with writer/director George A. Romero and stars John Amplas and Tom Savini. The DVD also includes the theatrical trailer. Suggested retail price: $29.98. For more information, contact the Anchor Bay Entertainment Web site.